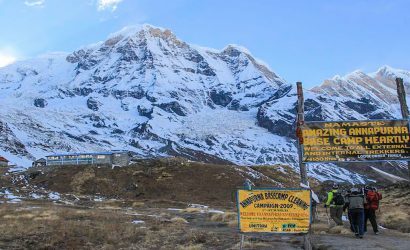 Island Peak or the Imja Tse trek is an extraordinary trek, in addition to the Everest base camp trek. 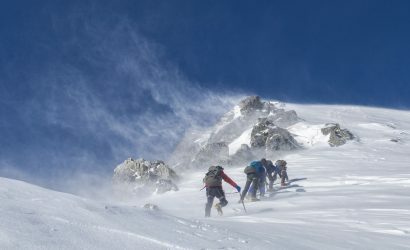 It is a great way to explore the Himalayas and also to gear up for higher peaks. The Island peak with Everest Base Camp trek is designed for all types of trekkers, the stern, and the amateur. It has an impressive and a glaciated west face. The beauty and the thrill attracts a lot of trekkers to the Island Peak. Hundreds of trekkers come to Nepal every year for the very trek. The trek follows the classic Everest Base Camp trek. You will be heading north-east through Khumbu valley experiencing the culture and the hospitality of the Sherpas. The tea houses at Phakding, Namche, Dingboche, and Tengboche will welcome you for a comfortable stay. After the base camp, you will also be climbing the Kala Patthar, a popular nearby peak. This peak provides an enthralling view of the Everest, Nuptse, and Lhotse. On the 11th day, you will head towards the Island peak from Dingboche( 5545m). Ascending the Island Peak is challenging and you will need to be prepared with gears like crampons and ice axe. It is also because of the challenging endeavor, this trek is popular and in high demand. The captivating panoramic views of the Ama Dablam, Lhotse and Mera Peak atop the Island Peak is worth all the hard work and labor. Some stamina training will be a plus point if you determined to conquer this peak. Well, you can enjoy the descent. You will be descending through Chukkung, Dingboche, Tengboche and Namche Bazaar before reaching Lukla via Phakding. The descent is quite quick. The route to the Everest Base Camp passes through a number of villages that will give you the view of the local culture and the hospitality of the locals. The tea houses are an utter representation of culture and customs of the Nepali people at higher altitudes. The flora and fauna are not to be missed. The biodiversity of that place is unique and you can witness the nature in its true form. To witness the highest peak of the world, Everest at its nearest. Breathtaking views of the mountains and peaks that you triumph. To experience the cultural richness of the place. Our Representative will receive you at the airport and will provide you easy transfer to your hotel. Enjoy your day in Kathmandu, the capital city, and a cultural hub. 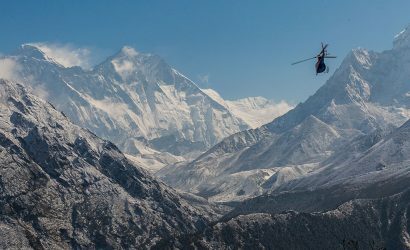 The flight from Kathmandu to Lukla will be a pretty one because you will be flying to the base of the Himalayas. If you are a digger for mountain flights, this one will give you a glimpse of flying over the mountains. You will be introduced to your guide and the porter. To begin with, you can enjoy an easy walk through the Chaurikharka village and descend the Dudh Koshi Ghat (2530m). This trail follows the Dudh Koshi River, the river that appears to look milky, hence its name Dudh meaning milk in Nepali. 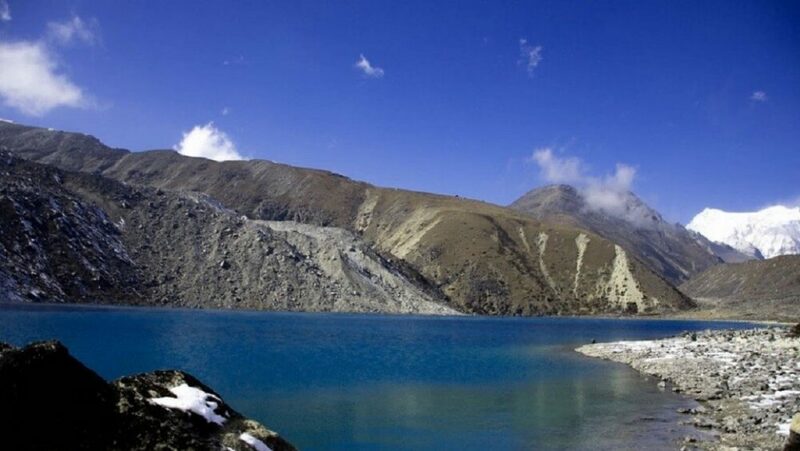 You will follow the river until you reach Phakding (2652m). Her we will stay for the night. Please enjoy the place and take time to acclimatize. After breakfast at Phakding, we will trek along a pine forest to Monjo. From here we will move to Namche Bazaar. It is the gateway to the Sagarmatha National Park. On the way, we will approach the Park entrance. We will descend the Dudh Koshi, Bhote Koshi river en route to Jorsale. Namche Bazaar is the set destination for today and it is a popular Sherpa village. 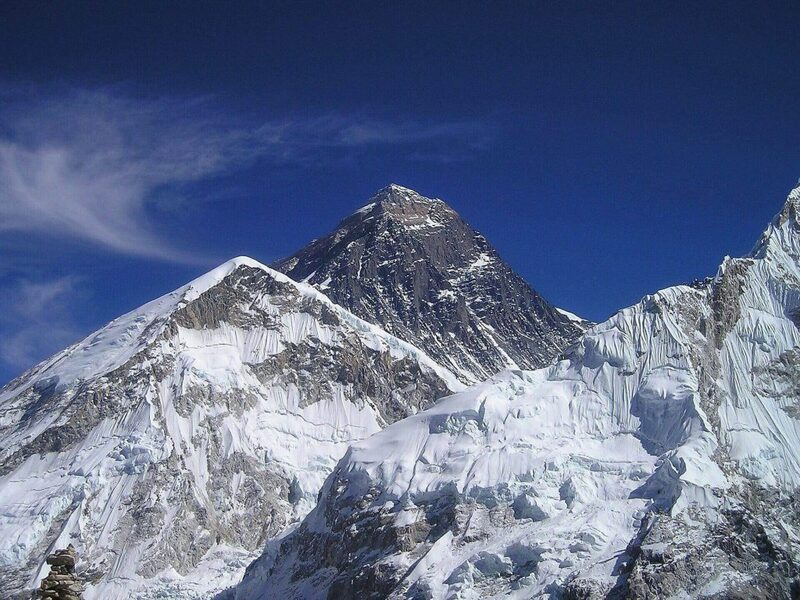 After a short hike, you will be witnessing the magnificent Mount Everest. This is after a short hike after you cross the bridge. The hike will continue from here until you reach the bazaar. You can enjoy the rest of the day exploring the culture of the locals and enjoying the local cuisines at Namche Bazaar. After reaching Namche Bazaar, you will need to get some time to acclimate in order to ascend further. This way your body will be able to adjust to the altitude and the hard work. This is a must and will only benefit you. We need to remain active throughout the day. You can explore the local culture, the village, and people. 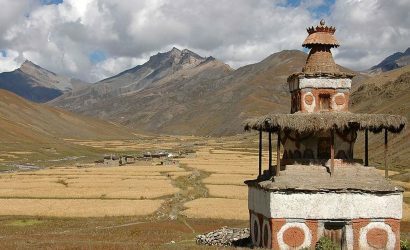 Villages like Khumjung or Khunde can be explored. Or you can hike to Thame, a nearby village. Also, take enough time to relax and enjoy the local food, the museum and the national park headquarter. The beauty of the number of Chortens, view of Mount Everest, Syanboche, view of the longest Mani wall in Khumbu will keep you engaged and entertained. A short hike will take us to a ridge. From here you will be heading towards Kyangjuma. From here you will descend passing the longest Mani wall. This is also one of the most picturesque sites in the region. 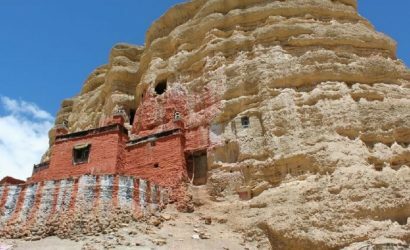 From Sanasa, a steep climb will trek you to Tengboche monastery. Tengboche, one of the most beautiful places in the Everest Region, is our destination today. You will witness breathtaking views of the Himalayas, the Everest, Nuptse, Lhotse, Ama Dablam, Thamserku, and Kwangde. The Tengboche monastery which is one of the oldest Buddhist monasteries is worth exploring. We will start our hike from Tengboche along the two gorgeous mountains Ama Dablam and Kantega. Apart from the local houses and people, you will notice an array of Chortens. We will trek through this route and cross the Ijma Khola and reach Pangboche. After you cross the village with the big Mani Stupa, you will now walk moderately. This wall is all the way to Dingboche. This place is a quaint Sherpa village, here you can view the mountains Lhotse, Island Peak and Ama Dablam. acclimatization and rest. Here you will feel the change in the altitude and will feel the need to acclimatize before you head on with your journey. With clear wheather, you will get to see the Ama Dablam mountain. You can walk through the village and take short walks or get some rest. From Dingboche, we will take a downward path to Pheriche village. 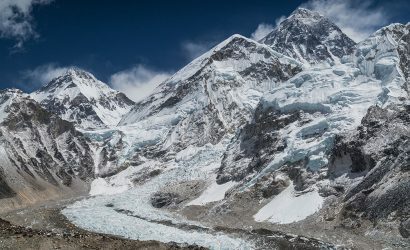 The trail will join the Dugla glacier before reaching the Khumbu glacier. You will pass through a stone memorial for the deceased climbers. After a steep climb, you can witness the breathtaking views of the mountain Pumori and other peaks. Today we will ascend 647m. Today you will walk along the Khumbu Glacier and up to the Everest Base Camp (5364m). This is the closest you can get to this glorious mountain. This a two to two and a half hour trek to Gorak Shep. Gorak Shep is a flat field just before the Kala Pattar and Mt. Pumori. The path is a bit slippery and rocky. But you will be surrounded by gigantic mountains on either side, this reward will keep you going. Great views of the icy glaciers and iceberg below the Khumbu glacier is just as impressive. After a while on a rocky path, you will reach the Everest Base Camp. After spending some time there, we shall trace back to Gorakshep. Here we will stay for the night. After breakfast, today we will climb up to Kala Patthar (5545) targeting not to miss the sunrise. Sunrise in the Himalayas is simply breathtaking and mellow. Mt.Lhotse 8516 m, Mt.Makalu 8481m, Mt.Cho Oyu 8201m, and Mt.Everest 8848 m are clearly visible and the sunrise makes it a lot tempting. Kala Pattar is one of the finest points to view the Everest. It is a favorite spot for the photographers. We will then return to Gorak Shep for some food and then passing through Dugla we will get to Dingboche for the night. Following the trail, we will gradually ascend all the way to the Island Base Camp. We will walk along the Ijma and Lhotse Glacier moraine. Today should be a different experience, we will be camping at the Island Base Camp. you can definitely see the Imja Tse, the Peak of the Island Peak and panoramic also the views of Mt. Ama Dablam 6812m, Mt. Nuptse 7879m, Mt. Lhotse 8501m. We will be starting early today. At around 1 -2 am we will start our trek. Today’s trek is a bit challenging yet driving. To be on top of 6189m is definitely challenging. It will take around 2 hours to reach the high camp that is followed by a rocky gully. The view of the mountains from the peak is spectacular. Mt. Lhotse 8501m, Lhotse Middle Peak 8410m, Lhotse Shar 8383m, Mt. Baruntse 7129m, Mt. Makalu 8475m, Mt. Nuptse 7879m, and other high peaks. We will retrace back to the Island Peak Base Camp and then all the way to Chhukung where we will rest for the night. After about 6-7 hours of walk today we will get back to the same bazaar that we started our journey in, Namche. Take your time to relax and enjoy the facilities that you have missed so far. Today is the last day of your trek. You will leave Namche after breakfast, like every other day. The trek passes through Phakding unless you reach Lukla. You will pass through the same scenery as before, but this time it may seem a lot different to you. After a 45 minute hike, you will reach Lukla where you will stay for the night. Please take your time to enjoy the memories you made, celebrate and rejoice your triumph. After breakfast, you will fly back to Kathmandu from Lukla. Hopefully, the weather in our favor, because the weather up in the mountains is absolutely unpredictable. After we reach Kathmandu, we will transfer you to your hotels. Take your time to enjoy, pack, celebrate and enjoy the city. You can choose to relax in a number of spas in Kathmandu. Feel rejuvenated and recharged. Today you could either choose to continue exploring the trails in Nepal or return. In either case, we will assist you. You will be transferred to the International Airport. Or if you choose to stay for some more adventure, we will be more than happy to introduce you to other packages we offer.